Sisters Mary and Anna Waldner making soap in 1977 at Brightstone Colony. 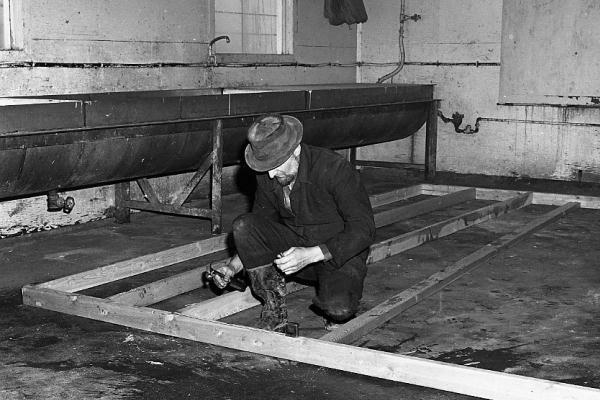 Most colonies still make soap from animal fat and lye to use for dish washing and laundry. 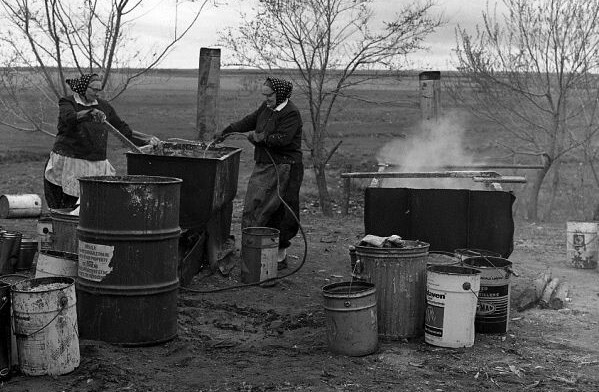 Making Ruschenspick Photo by: Henry Funk Sisters Mary and Anna Waldner making soap in 1977 at Brightstone Colony. 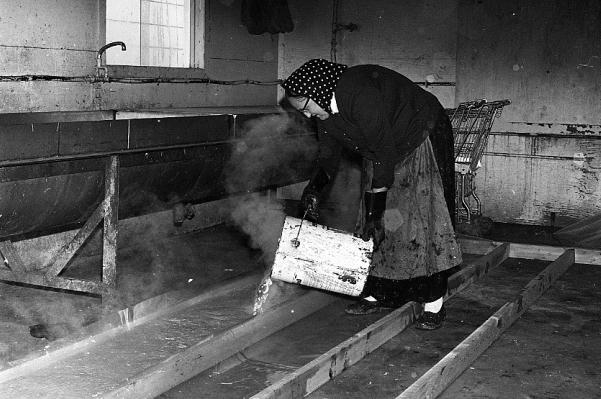 Most colonies still make soap from animal fat and lye to use for dish washing and laundry. Building Soap Molds Photo by: Henry Funk The finished soap will be poured into these plastic-covered 2 x 4 molds. Plastic sheets keep the ruschenspick clean and free of debris. 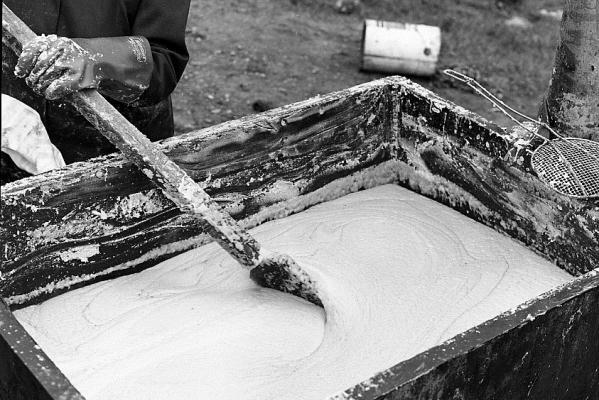 Stirring Soap Photo by: Henry Funk The liquid soap mixture has to be continuously boiled and stirred until a consistent blend is achieved. Pouring Soap into Molds Photo by: Henry Funk While the liquid is still hot and viscous, it's poured into large 2x4 molds where it will cure for a day before being cut into small 2"x2"x3" chunks of solid ruschenspick (soap) to dry and use; some of the chunks are ground into powder. Fabric Day! Photo by: Henry Funk Although clothing is no longer all homemade, every colony has a Zeichschneiderin who is responsible for purchasing the various fabric types used for making clothes. 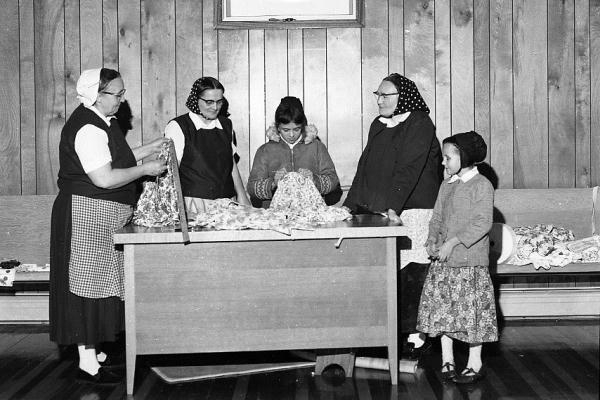 Individuals all receive a yearly allotment of the fabric required to make the clothes for the year. Fabric for pants, dresses, shirts and underwear is handed out. 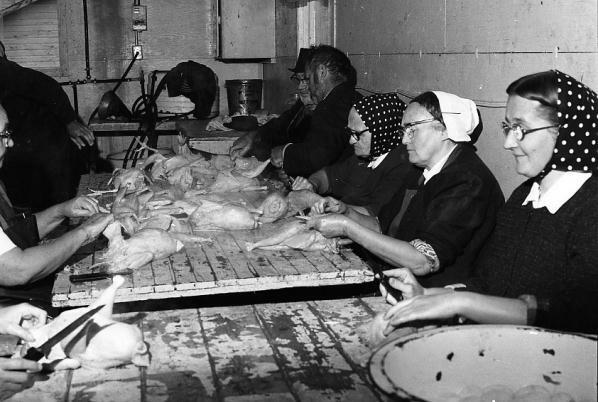 Cleaning Poultry Photo by: Henry Funk Part of the chicken butchering process included removing reluctant tail feathers, if they weren't properly removed by the rubbler.